Thank you for joining me in this new blog series. I'm going to show you how I cut out the lesson planning stress from my life! Like most systems that run like clockwork with very little maintenance, there is a lot of "upfront" work to get the system running smoothly. My lesson plan format was the same way! One thing to understand about my classroom is that I do not use textbooks at all. You could - no judgement here, but I don't. Sure, my school/district has textbooks, but I found years ago that if I followed the textbooks I wasn't meeting the needs of all of my students. First of all, the textbooks never followed our standards exactly. Also, they didn't allow for differentiation in the way that I wanted. So, I decided to ditch the textbooks and use my standards to drive my instruction. I knew that I wanted to plan each subject in "units" that let me see the entire scope and sequence at once. I would be beginning with the end in mind. Most teachers already do this for science and social studies....possibly even math, but I do it for all subjects - reading and writing included. Most of the reading standards are "general" and can be taught through any genre. What I realized in my classroom was that students were bored out of their minds reading the same basal story each day of the week, and there was no "connection" to a weekly guided reading story. Therefore, I chose to teach through genres that I thought would interest my students (and the ones that are specifically in my standards) to create my reading units - mysteries, informational, biographies, poetry, tall tales, fables, and fairy tales. By doing this, all students are "connected" - no matter what they're reading level - by learning the characteristics of a specific genre, while also being instructed at their own reading level within that genre. Everyone is on the same page - there's a passion and excitement for reading happening at all levels and the class is able to celebrate their learning together at the end of each unit. There's so much to be said for classroom community - even in the academic aspect. 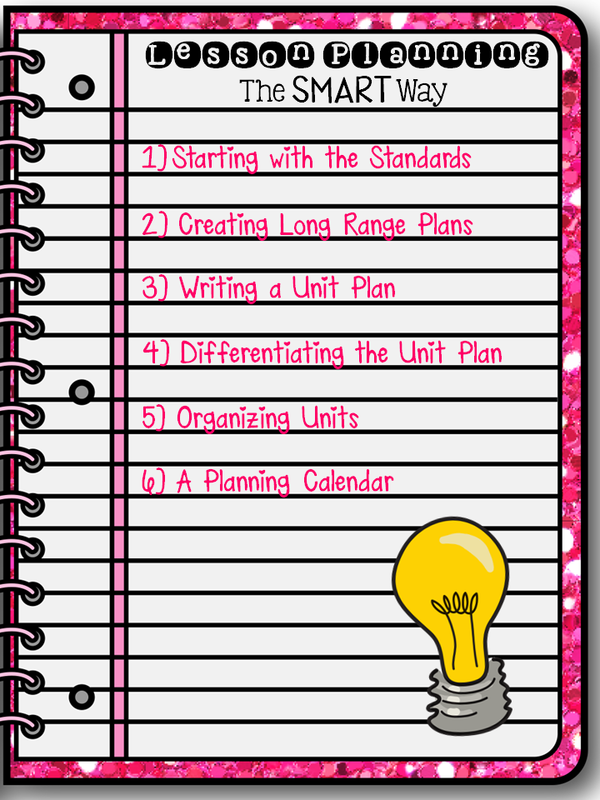 I knew my standards needed to be my starting point for creating my unit plans. When I went online to download my standards, I found that they were NOT in a user-friendly format. 20 pages for just ELA standards?!? Ugh! So my first task was to retype all of my standards into an "at-a-glance" format. Yes, this took a while, but, yes, it was completely worth it! I now have all of my standards in an easy-to-read format at my fingertips at all times. These standards are the foundation of all of my lesson plans. By looking at what needs to be taught, I'm able to create my units with the standards in mind. As I create a unit, I highlight the standards being addressed in that unit. This ensures that I'm making sure ALL of my standards are included for the year - most of them will be hit several times throughout several units! So, what are you waiting for?? 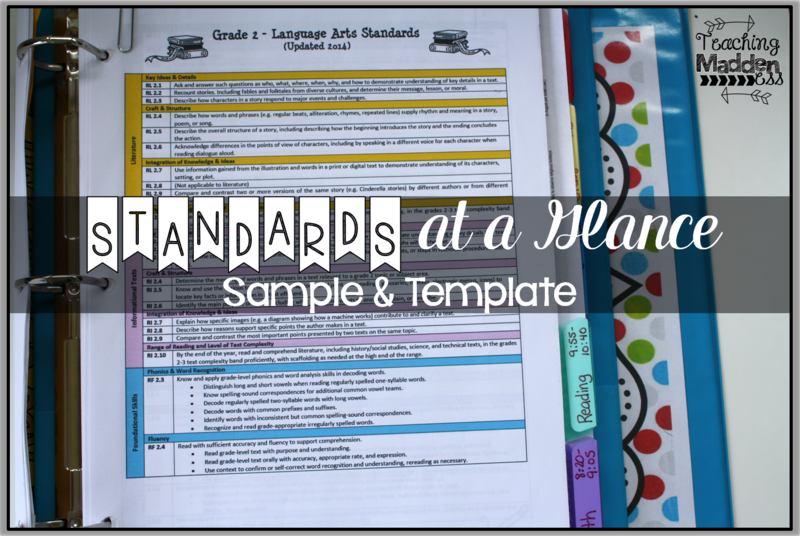 Go download your standards and get them in an easy-to-use format this week! I just used Microsoft Word and a simple table for organizing mine - whatever works for you! 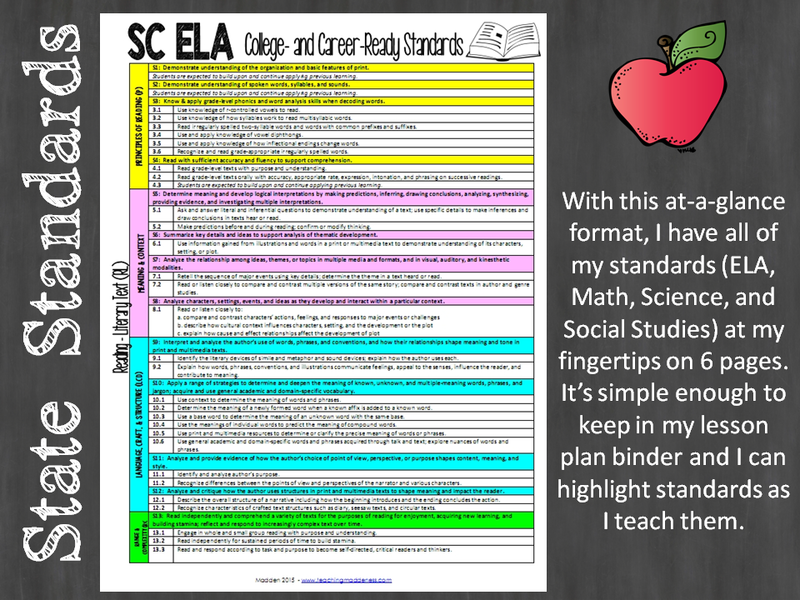 If you happen to teach in South Carolina, I've already created an at-a-glance format for our new College and Career Ready Standards that will be implemented in 2015-2016 and you can download them below! 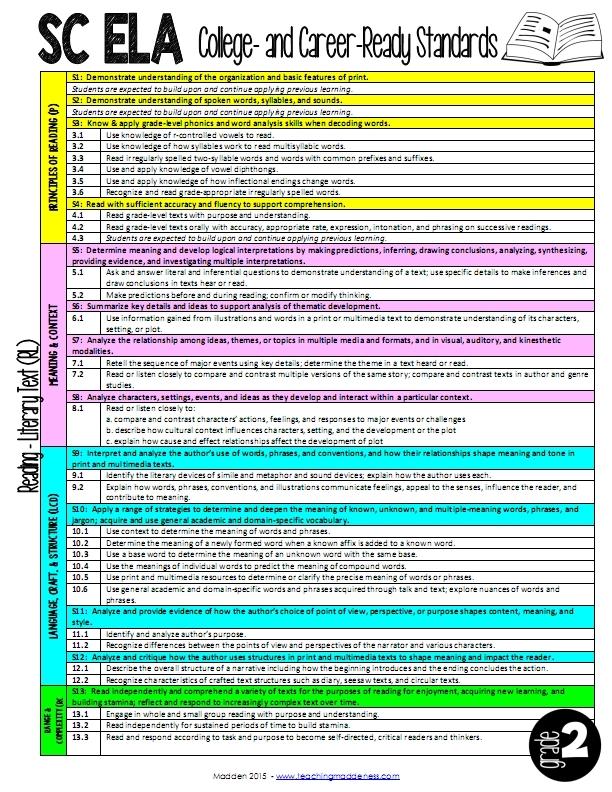 If you're still using Common Core, you may find my "at-a-glance" format from last year helpful. You can download it HERE. 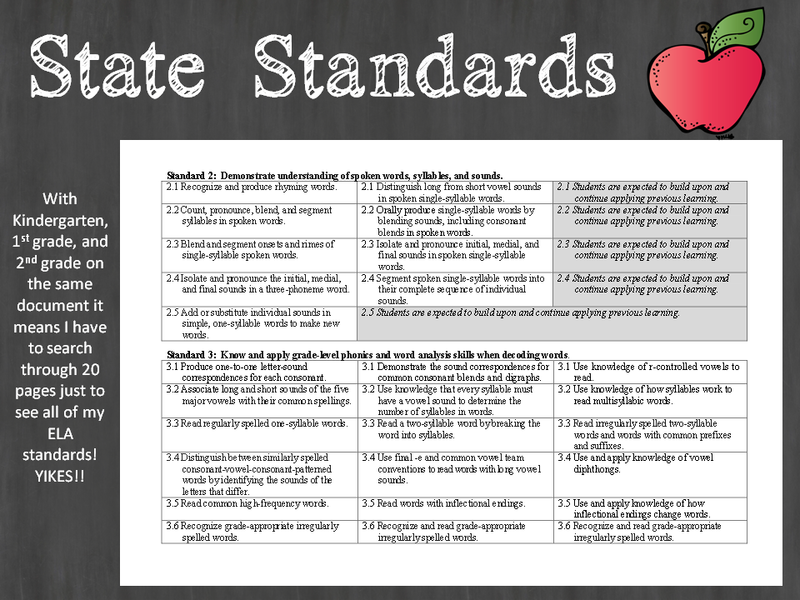 (*UPDATED* Template Available Here) If you teach a different grade, or have your own state standards, I encourage you to put those standards in an "at-a-glance" format to drive your instruction! Come back next week for part 2 in this series....Creating Long Range Plans. Just checked in during my planning time to see if you had posted this yet! :) And you had. Can't wait to read more! You are so organized. It's my 10th year and I still feel like its the 1st or 2nd. Yikes! Maybe it's because I haven't been planning "the smart way." Thank you for all of this information! I also have textbooks that I don't like to use because they don't meet the needs of my students and don't follow the new standards. I've added another task on my to do list- getting my standards in order! Amen on the textbooks! I feel free without them. Thanks for being such a great role model of organization! I love this and cannot wait to read more! I am so NOT a planner...shhhhh. I just procrastinate every single weekend! Look forward to more my organized friend! So glad you are saying what you are; some people don't think this way until we become a resounding gong, sadly. You go girlie! Thanks for speaking up and sharing your heart and craft!